The last installment of our Growth-Driven Design blog series focused on strategy development. To recap, quickly, during the strategy phase you set performance goals, develop persona profiles, chart customer journeys and leverage your existing site’s analytics and user research. In doing so, the guesswork is removed from the equation—establishing in its place a strong understanding of your business goals and website users. With the strategy phase complete, it is now time to begin the Launch Pad phase. While the Launch Pad website operates as a fully functioning website and looks and performs better than your current site, it’s not a final product. The Launch Pad is comprised of the essential components necessary to help your visitors understand your business and activate them to seek more information. As they interact with your website, you’ll be able to collect behavioral data and feedback from your users. This data provides invaluable insights into user behavior after launch and can then be leveraged to help you make more informed decisions on which features make the most sense to incorporate into the site in the next continuous improvement cycle. Provide data-driven insights into what pages and functionality to incorporate into the site next and how to prioritize adding them. For some the idea of a Launch Pad website is uncomfortable. You are building a new website, and the expectation is that it will be bigger and better than your current site—and it will, just not right out of the gate. To get comfortable here, you must accept the fact that you do not fully understand everything about your site visitors or how they will interact with your website. Recognizing this truth makes it clear why you shouldn’t immediately plan for and build out every conceivable aspect of your website. It just doesn’t make sense to spend time building pages and developing site functionality when it’s unclear whether it will be useful to your prospects. Remember, the goal of the Launch Pad is to develop and launch a fully functioning website that looks and performs better than the one you currently have, but in a fraction of the time it takes to launch a traditional website. “Is this action item a Must Have or a Nice to Have”? Take the items you designated as “nice to have” and leave them off to the side. Now, focusing only on the “must haves” items, evaluate them further by answering the question, “Is this absolutely necessary for the initial Launch Pad site, or could it be added to the launch pad in one to three months down the road?” Whatever is left should be included in the Launch Pad. To help evaluate which pages are “must haves,” use website analytics to determine what your top pages are, which pages provide the highest conversion rates and where users are spending the most time on your site. Heatmapping software (e.g., CrazyEgg and HotJar) is another valuable analytical tool to help determine which pages to include in the Launch Pad. It will provide a visual representation of user click, tap and scroll data and is a vital tool for improving user experience (UX), maximizing conversion rates and keeping site visitors on the right track. we believe adding an [e-book] on [Growth Driven Design] will [boost lead conversions by 10 percent]. and development web page from our e-newsletter/blog articles]. Since not every page of the Launch Pad will be initially focused on driving the highest impact and value, you will want to revisit SEO, update any images to match the new site design and edit/polish the rest of your content before migrating into your new website. If the site doesn’t work, it won’t convert. The quality assurance and site testing stage is an essential part of your overall website strategy. A website not adequately tested for performance optimization will see high user abandonment rates and poor search engine rankings. Below is a checklist of items that should be tested and reviewed before the launch of your Launch Pad. Interested in learning more about the Growth-Driven Design process? 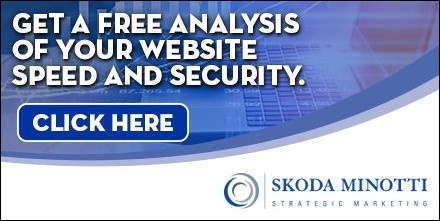 Skoda Minotti Strategic Marketing is a Growth-Driven Design Agency Certified, and we can help you determine how this approach might improve your next website design project. To start the conversation, contact Jonathan Ebenstein at 440-449-6800 or fill out our contact form here. This entry was posted in Digital Marketing, Mailchimp RSS, Strategic Marketing and tagged growth-driven design, Launch Pad, strategic marketing, strategy development, website design. Bookmark the permalink. Follow any comments here with the RSS feed for this post. Comments are closed, but you can leave a trackback: Trackback URL.